STOP HS2 | Lord Framlingham: Are they afraid of the truth about HS2? My Lords, I make no apology for returning to the vexed question of HS2, as this ridiculous scheme is getting under way. Demolition is starting, burial grounds dug up, trees felled and communities disrupted. The utmost pressure must be kept on in the hope that government common sense will prevail and an urgent review will be ordered. It is difficult to comprehend the enormity of the folly that is HS2. It is so monstrous that most people simply cannot believe it. On 31 January this year, I moved an amendment to the Third Reading of the HS2 Bill that would have put an end to it. Most of your Lordships voted against my amendment, while telling me privately that they agreed with it, but 26 Members of this House voted with me to stop HS2. Were these 26 ill-informed, or were they perhaps the best informed Members of your Lordships’ House? Two of them were former Permanent Secretaries to the Treasury. 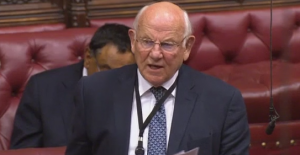 Terry Burns, the noble Lord, Lord Burns, saw HS2 at first hand under Gordon Brown, and the noble Lord, Lord Macpherson, studied it under David Cameron and George Osborne. Both of them were so convinced of the case against continuing that they voted to stop it even at that stage. Every dispassionate observer who is properly qualified and experienced in our railway system is opposed to it. A long list of railway experts who have no axe to grind have written to Ministers pleading for a meeting to put their case to help the Government to understand the dangers. They have been rebuffed. Every supposed benefit of this project, including speed and capacity, has been comprehensively taken apart by those professionals, who really know what they are talking about. The noble Lord, Lord Darling, when he was Secretary of State for Transport, was so worried about the scheme that he commissioned a no-nonsense report from Sir Rod Eddington, the former boss of British Airways. Eddington’s report, which was published in 2006 was emphatic: this kind of scheme was wrong in principle and should not be undertaken. His report was enthusiastically welcomed by the Secretary of State and officials in Whitehall. A critical report by Sir Jeremy Heywood in 2016 has not yet been made public. I wonder why. A consultant in this field, Michael Byng, was commissioned by the noble Lord, Lord Berkeley, to scrutinise the costings of HS2. His results showed that the scheme is likely to cost twice as much as the original estimate. We are talking about unbelievable amounts of money. The forecast cost was £56 billion, now thought to be nearer £70 billion, and some say eventually £100 billion. I am reliably informed that for the price of HS2 we could rebuild and re-equip every hospital in England and Wales. Today we launched our new aircraft carrier HMS “Queen Elizabeth”, which cost £3 billion, described as an astronomic sum. In HS2 terms, it is peanuts. This scheme will last for years, a running sore constantly reminding whatever Government are in power of the massive mistake that was made through sheer obstinacy and an unwillingness to listen. It will be an ongoing financial and environmental nightmare. Serious disruption will soon start in Camden despite the fact that there are still uncertainties surrounding how the scheme will work in the area. Homes are to be demolished, burial grounds dug up, businesses disrupted, and mature London plane trees felled. The Woodland Trust tells us that, further afield along its route, 63 ancient woodlands will be lost or damaged. This entire project is not worth the life of a single tree. To defend the indefensible, HS2 is reported to be employing 17 PR firms to sell its case—gravy train upon gravy train. One firm is reported as being paid ​£280,000 to extol the virtues of HS2 to primary schools along the route. There is a constant stream of reports of hirings, firings and squabbling over contracts by those seeking a slice of the huge sums involved. What we need, what we must have before things go any further, is an urgent, open, Treasury-led review of the situation with proper professional independent advice taken and listened to. What harm can that do? What are people afraid of? Perhaps it is the truth. Surely, when such huge amounts of public money are being spent and such immense damage is being done, both to our urban environment and our countryside, it is vital to get at the truth. So what can you do for me, My Lord?